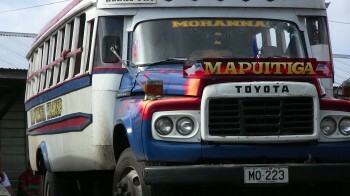 A typical Samoan bus - wooden body on a Toyota truck chassis and motor. Oozing with character and itching for a bit of fun! Last week, Debbie and I decided to push forward with an idea that I first conceptualised in 2009, and setup in March of 2010 – a themed bus for the marketing of Samoa. Imagine what Walt Disney would do with a local wooden-body bus in Samoa and cross that with Bill Gates in IT, Marketing Stevo from Apple, and what Croc Dundee did for Australian Tourism marketing. 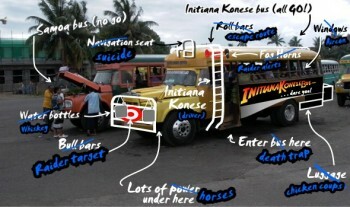 I called the thing the Initiana Konese Bus. When you see it, you will understand much more about how and why we’ve done it this way. The hard part has been attempting to gain traction with the Samoan Tourism Authority in any area of support – politics, bureaucratic formalities, personalities and a whole bunch of other ugly stuff. We gave up waiting and took the advice that we’ve been given by many when attempting to deal with them – just get on with it and do it yourself! They may get behind the bus when it suits them. We’ll see about that in due course but after 18 months of waiting and many months this year pushing the proverbial we’ve had to start without them. To be perfectly honest, we’ve been burning our capital for far too long and waiting for them to work with us. The partnership that we sought might take a while to eventuate, methinks. So last week after we were put off yet another time by STA (“We’re too busy to talk” sort of stuff), we just got the idea files out and looked at what we COULD do that would set the whole thing off with a bang. We have now approached six businesses here in Samoa and initial feedback is that the Initiana Konese Bus is definitely a winning concept. Yay! 1. The first company that we spoke to about it last week (that has an ultra-high profile in both New Zealand and Samoa) told us that – “You have an outstanding idea!” and then told us who to speak to in New Zealand and how to pitch their involvement. Hmmm, that was encouraging start! 2. The second company we spoke to received a full sponsorship promotional presentation from us, complete with photos and a copy of the Initiana Konese website. They loved the Samoan community aspect of the project and showed a very strong interest in one of the prime sponsorship spots. 3. Our third presentation was to a potential partner, not necessarily a sponsor, and they showed a strong interest in working together. When (or if) this partnership goes ahead, we will definitely have a fantastic tour of New Zealand with many more people in the entourage. 4. The fourth presentation was to a large Samoa-based company that has no interest in working in New Zealand and focused results on-island. We had a very good meeting but no immediate possibility of doing business, certainly not in the New Zealand market – they are 100% Samoa, and interested in domestic, not tourism either. 5. The fifth presentation was to a media company that loved the idea and encouraged us to press on with the concept, and offered us any support that we needed. They are our friends and we’ll be sure to be feeding them story after story as things develop. 6. Our sixth presentation was to a company whose Sales & Marketing manager was totally stoked that we would come up with such an amazing idea and who clearly wanted to be involved. As we had been praying for supporters to join in and support us, he had been praying for somebody who could give vision and hope in a flat, unimaginative business environment. And we walked in out of the blue and said “Hi! Can you sponsor us, and get us a bus, and keep it running for us nationwide while we do our stuff? We’ll do whatever you want us to do for marketing your brand throughout New Zealand . . . ” Again, we received very strong interest and have forged a strong friendship as a result. As a result of one phone call and a part day of meetings, we have confirmation from multiple key people that our idea “has legs”, is likely to attract the required sponsorship, and that we ‘may’ possibly even have a bus chassis being lined up for us as we speak. Two of the possible five major sponsorship slots seemingly sorted in our first day on the road is an exciting start to an exciting project. Our prayers tonight will be more along the lines of “Thank you!” rather than “Please!” What a pleasant change. We look forward to getting the word out and letting others get involved and behind the project.